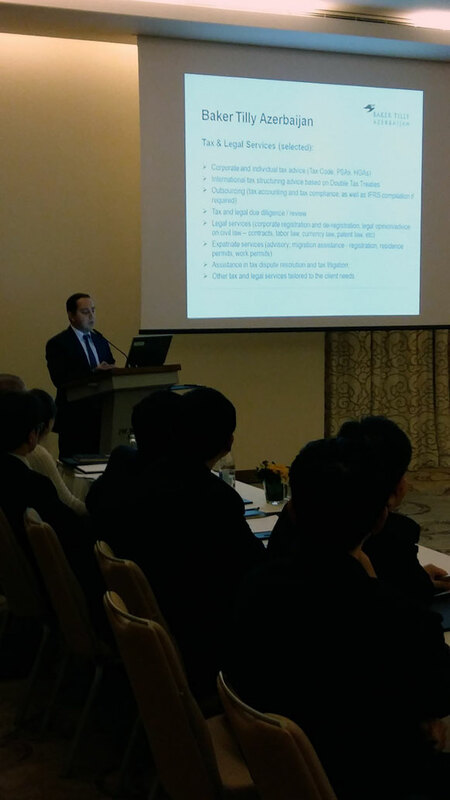 By invitation of His Excellency Mr. Kim Chang-gyu, the newly-appointed Ambassador of the Republic of Korea to Azerbaijan, Baker Tilly Azerbaijan has made a presentation at a seminar held in Marriott Hotel on November 12, 2015. The seminar was organized with an aim to inform all the Korean companies operating in Azerbaijan about the existing legal framework for taxation. The presentation made by our Senior Tax and Legal Manager Azer Akbarov was dedicated to the Overview of Taxation System in the Republic of Azerbaijan, including existing taxation regimes and details of various taxes levied in Azerbaijan.